I wanted to take a moment and wish you and yours a HAPPY NEW YEAR!! Thank you for a great 2015! Superteach is looking forward to many great things in 2016. I appreciate you being supportive and following along as we look at ways to teach kids with special needs. Before you go out celebrating- take a quick look at a new product that just got put up at the Superteach's TPT store. Lets start the new year off with a 1/2 price sale on new winter items in my store. The item below is one. Starting at 12PM EST 12/31/15 my new items will be half off. That means you could get the item below for $1.50. Do you ever have that student or couple of students that really have a hard time learning to count? They are getting older every year but you need something new to reteach the numbers or just to give extra practice in independent work time or center time. Well here is something that is easy to make and easy to use. Its a counting practice book but it has some substance to it for use with those kids a little older still working on mastering counting. This book is a winter edition and is all about Penguins. 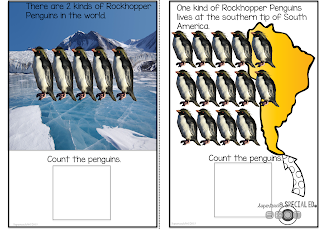 This is an interactive book that is great for practicing counting number from 0-20 PLUS its a WINTER edition so its all about penguins; Rockhopper penguins to be exact. Your students will reading about these great little penguins that jump out of the water and slide on their stomachs onto ice. They can read about the penguins and practice their counting all at the same time. 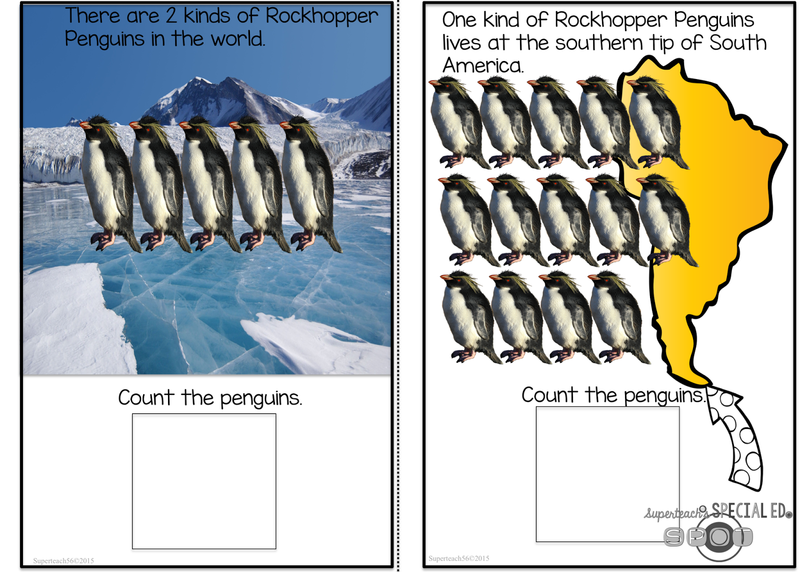 The kids read (or have read to them) the penguin fact, count the penguins, then find the number card that matches the number of penguins on that page and attach it to the answer square. Heres is a quick look video.